New Zealand UIN 512 Coded for New Zealand Vessels! KTI’s Safety Alert SA1 GPS EPIRB gives advanced 120 metre location accuracy and provides 72 hours transmission time once activated. Featuring an in-built high intensity strobe light for visual detection especially in poor visibility conditions, the Safety Alert SA1 GPS aids a quick and precise location in an emergency. RCCNZ Retailer Role – What you should expect from us. The Safety Alert SA1 GPS EPIRB is low maintenance and extremely cost effective. 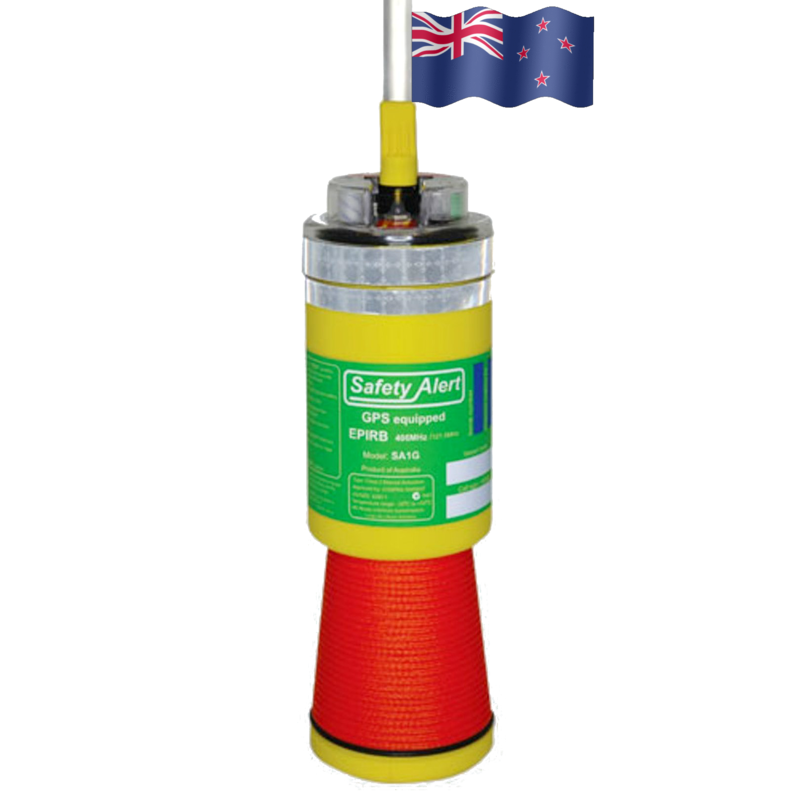 10 Year Battery & Warranty, Safety Alert SA1 GPS New Zealand EPIRB’s give advanced accuracy and provide up to 72 hours transmission time once activated. Featuring an in-built intensity strobe light for visual detection especially in poor visibility conditions, the Safety Alert SA1 GPS aid rapid and precise location in an emergency. In an engineering world first and now available to New Zealand registered vessels and or residents, it has been designed as the first and only approved EPIRB with an exclusive 10 YEAR BATTERY and 10 YEAR WARRANTY. The Safety Alert SA1 GPS is designed to go the distance so you may have complete confidence on the water and on land. Don’t buy a foreign 406 MHz beacon, buy this one! Each country has an individual 406 code. When you purchase a 406 MHz distress beacon, make sure it is coded for New Zealand, just like this one. The New Zealand Country Code is 512. If you buy one from overseas or over the Internet, it could be an expensive mistake. When it is activated the satellite may notify the wrong rescue coordination centre which could mean a long, potentially life-threatening delay in your rescue. You must register your new beacon. This means search and rescue can contact you to verify an activation. This improves search response time and cuts down on false alarms. Once your beacon is registered, you will need to keep your details up to date and notify the register if the beacon changes ownership. Registration is FREE. When you first purchase a 406 MHz beacon it’s vital that you register it with the Rescue Coordination Centre New Zealand (RCCNZ). This is a FREE service and applies to all beacons – new or used, separate or installed in a boat, aircraft or vehicle. It helps to locate you faster. It ensures the most appropriate search and rescue team is sent. When you activate a 406 MHz beacon, it is quickly identified by satellite, which then alerts RCCNZ. If you register, the identification code in your beacon can be searched in the database, so RCCNZ know who you are, who your emergency contacts are and what type of vessel, aircraft or vehicle you are in, or if you are tramping, hunting or diving. RCCNZ may also be able to find out exactly who is with you and how long you have been gone, so they can be in the best position to help you when you are located. Registering your beacon also helps to eliminate false alarms, which divert search and rescue resources away from genuine emergencies. If you move house or change your phone number, you must update your details with RCCNZ. If you sell your beacon or boat, aircraft or vehicle with a beacon in it, tell the new owner to re-register the beacon. Give them this website address or RCCNZ’s phone number. Also advise RCCNZ of the transaction yourself, to ensure the details have been updated, or in an emergency, it will be you that will be contacted. If you dispose of the beacon or it is lost or stolen, please advise RCCNZ by calling 0800 406 111 (or +64 4 577 8033). Fill out the online 406 registration form. Phone 0800 406 111 if you have any questions about registering your beacon. New Zealand buyers are responsible for any duties/tariffs that may be incurred after passing through customs. Unfortunately we are not supplied with specific information as to how much the duties and taxes may be in your country. It is possible for you as the customer to contact customs in your country to get an estimate of the amounts. Please note that due to legal reasons, we do not ‘modify’ customs forms by declaring packages as a ‘gift’ or by declaring a product value less than the actual amount paid.